A practical joke from 1947 is the source of the “Black Dahlia Avenger” franchise. Police and the newspapers attached no significance whatsoever to these prank messages. it wasn’t until Steve Hodel came along in 2003 that “Black Dahlia Avenger” was anything but a joke. 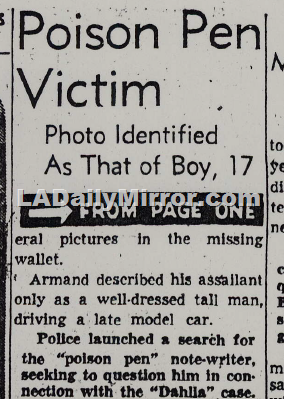 On Jan. 30, 1947, the Los Angeles Herald-Express published, under the subhead “ ‘Idiots’ Delight Messages,” a communication of cut-out words and the picture of a young man later identified as Armand Robles. Here’s the actual photograph, from the Los Angeles Public Library. The Herald-Express retouched the picture for publication. It also ran the unretouched image. The next day, the Herald-Express ran the picture of Armand Robles holding the previous day’s front page. Here’s the image from the Los Angeles Public Library’s photo collection. There were still more messages, signed “Black Dahlia Avenger” or B.D.A. These two postcards from “B.D.A.” were sent Jan. 29, 1947. Black Dahlia Avenger was nothing but a practical joke and whoever sent the messages must be laughing, if only in the afterlife. This entry was posted in 1947, Black Dahlia, Cold Cases, Crime and Courts, Homicide, LAPD and tagged #Los Angeles Public Library, 1947, Armand Robles, Black Dahlia, Black Dahlia Avenger, Cold Cases, crime and courts, George Hodel, homicide, lapd, Steve Hodel. Bookmark the permalink.